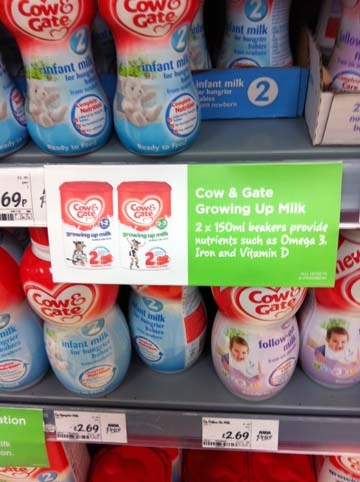 Danone promotion of its Cow & Gate brand of baby milk in ASDA has been brought to Baby Milk Action’s attention. We are communicating with ASDA about the promotion and the misleading claims being used in it. Curiously, ASDA told us it was unaware of the promotion and we encouraged management to investigate and take action. The promotion has appeared on table displays in the ASDA café, on shelf-talkers next to products and in leaflets promoting a “Baby and Toddler Event” currently taking place in ASDA stores. People are encouraged to put questions to ASDA pharmacy staff. 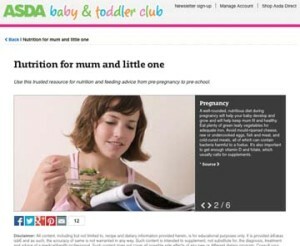 They are also encouraged to visit ASDA’s “Baby and Toddler Club” website, though a disclaimer states no responsibility is taken for the accuracy of the information provided. Please check in your local ASDA and other stores for evidence of this and other baby milk promotions and send this to me at Baby Milk Action: monitoring@babymilkaction.org – Order Baby Milk Action’s monitoring kit (including “spot it – report it” cards to help with your monitoring – click here. Claimed benefits for added nutrients in formulas and so-called growing-up milks are misleading. Parents who buy growing-up milks should be aware that these products are an unnecessary expense and also potentially harmful. It is, therefore, highly misleading to imply that such milks are required to obtain “hard-to-get nutrients”. 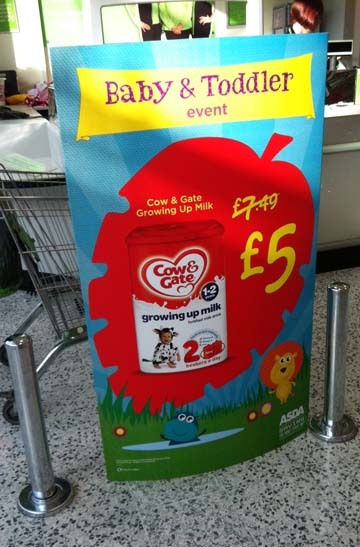 ASDA is also promoting the milks with these claims as part of a “baby and toddler event”. The example below is from Lower Earley, Reading. Shelf-talkers also promote the milks. 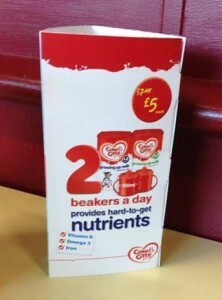 In ASDA, Lower Earley, Reading, these are displayed next to the infant formula, which is prohibited by the Infant Formula and Follow-on Formula Regulations (2007). These state that there should be “no promotional activity to induce the sale of an infant formula.” The Guidance Notes to the law say that shelf-talkers should not be displayed next to infant formula. The above photograph also shows how ASDA displays the infant formula and follow-on formula next to each other on the shelf. However, the Guidance Notes to the law state: “Follow-on formula should be located at a different part of the store to infant formula. If this is not possible they should be clearly separated in physical location.” This is to stop promotion for follow-on formula being used to promote infant formula; it is illegal to promote infant formula. The World Health Organisation has also said that follow-on milks and growing-up milks are simply not necessary – click here for our press release. We might add, they are therefore a waste of money and a cynical rip off, exploiting the wish of every parent to do the best for their child. They may not be exactly the same wording, but are still misleading in implying these milks are necessary to provide“hard-to-get nutrients”. 1. 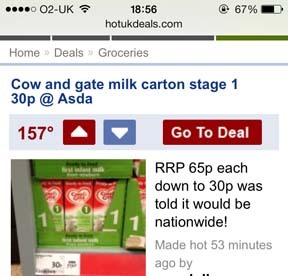 Is ASDA aware of the Danone Cow & Gate promotion taking place in its stores? 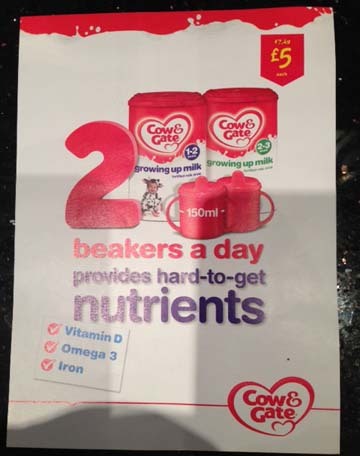 In addition to the displays on tables, we have been sent a scan of a leaflet from the ASDA pharmacy. We are still waiting for answers to the following questions. 2. Did ASDA give prior approval for the promotion and the materials to be used? 3. Does ASDA accept joint responsibility for the misleading nature of this promotional campaign and possible harmful effects in infants and young children fed on the milks as a result of it? 4. How long will ASDA allow the promotion to continue in its stores? ASDA tells us that other Point-of-Sale materials were removed last week and we have asked for a copy of these.